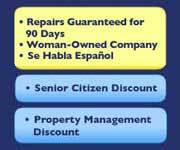 All of our repairs are guaranteed for 90 days. If you are comparing having your existing machine repaired or replacing it with machine that is comparable in price with what you paid for your machine 10 or so years ago, you will not be making a valid comparison. The machines are neither similar in quality nor durability for the same price. If you were to merely replace your existing appliance with one that costs about what you paid a decade ago, you’ll be repairing or junking the new machine every three to four years. You’ll either have to pay more up front for a new, high-quality machine that will give you another 10 years of trouble-free operation or you pay less up front for a low-end machine and then pay-as-you-go for repairs. When asking, "How much is a new one?" you need to consider both the quality of appliance you can afford as a replacement and the option of having your existing appliance properly repaired by a competent professional. Thomas Appliance Service can diagnose and evaluate your appliance to determine if it’s in your best interest to repair or replace it and make a recommendation accordingly. Also, another cost associated with buying a new appliance is the "aggra-dollars." That is, the aggravation and time spent that goes along with shopping for a new appliance: having it delivered, getting it installed, and disposing of your old one. If you’ve not experienced this joy recently, you’ll realize that the aggra-dollar factor can be a very significant cost. Believe it or not, an appliance can be bumped or "hum" itself unplugged. This is common with washing machines. Retail prices for major appliances have stayed flat over the past 15 years even though manufacturing costs and inflation have risen steadily during that time. Manufacturers today continue to offer low prices on their lower quality appliances and then offer their choice lines of appliances at a higher price point. Refrigeration is the process of removing heat. A thermostat in the fresh food section controls the temperature (On/Off) of the refrigerator's compressor. Newer refrigerators have thinner walls and less insulation; therefore, the ambient heat load transfers quicker to inside the refrigerator causing the refrigerator to cycle on more frequently. A dirty condenser coil slows down the heat transfer from inside to outside the refrigerator. Warm food placed inside adds to the running time as does worn door gaskets which allow heat to intrude. Restricted air flow vents also slows down the process. Why does my refrigerator leak water on the floor? Modern frost-free refrigerators melt ice and frost off the coils which creates water. Some models use a heated catch pan to cause the water to evaporate while others use a simple drain hose which can easily become clogged. In either case, the pan is usually small and will overflow, so that's what you're seeing. A preventive maintenance program will eliminate this problem. What is the best setting for my refrigerator? The factory has designed a mid scale position on thermostats as a typical setting. If any adjustments are necessary, they should be in small increments and you should allow 24 hours for the refrigerator to stabilize before making further adjustments. Why do the burners on my range not work all the time? Loose connections are usually the cause of intermittent operation. Sometimes a faulty control switch will produce the same symptom. Why does it take too long for my clothes to dry? There are two components required for efficient dryer operation: heat and air flow. The thermostat setting (Regular - Permanent Press - Heavy Duty) controls the setting. If the venting system is obstructed in any way, even partially, the dryer cannot get rid of the moisture. It is equally as important to keep the filter screen clean, preferable after each load. Finally, overloading the dryer is the most common cause of dryer inefficiency. Why does my washer stop at the rinse cycle? Most modern washers use cold water for rinsing clothes. If the cold water side of the water valve is clogged or not otherwise working, the washer waits until the tub is filled before advancing through the cycle. No water, no cycle. You can prevent disposal "bad breath" by regularly running the disposal while putting ice cubes and cold water through the system. This will break up the food and grease that has collected in the disposal which is the usual cause of the odor. Finish the process with a piece of fresh citrus rind which will leave a pleasant scent. How can I make my microwave pop all of the popcorn? Most of the popcorn will pop if you do this: Take a microwave safe pie plate and turn it upside down in the center of the microwave. Place the popcorn on top of the upside-down plate and proceed with the popping instructions. Why do my glasses come out of the dishwasher foggy? This is usually the result of using too much dishwasher detergent. Adjust the amounts of detergent used by considering the softness of the water. Also the use of a rinsing agent such as Jet Dry will alleviate most of this. Why does my dishwasher leak out of the bottom when it's in the wash cycle? Most likely the door seal is worn out. Open the door and closely inspect the gasket, It's usually either mashed or torn near the bottom. Replacement is typically very easy. Simply pull the old one out of the slot it sits in and put the new one back in the slot.